At a recent book signing and cooking class with Joe Yonan, Food and Travel Editor at the Washington Post. Joe treated us to a small private cooking demonstration hosted by SingularCity. When I asked the columnist of “Cooking for One” for his most romantic recipe for our Love Potions, Joe immediately knew his chocolate chip recipe he made for his boyfriend Carl was the one that all single daters would enjoy. Joe proudly told me this was the most romantic recipe in his new book, Eat Your Vegetables: Bold Recipes for the Single Cook . In an excerpt in Joe’s book, he say, “Perhaps it’s not wise, but I judge a relationship potential by how a guy eats. That is, a man who consumes food with gusto stands a better chance with me than one who pokes around at his plate, complains about a (large) portion sizes, or declares dessert off-limits. One day when Joe’s boyfriend Carl wasn’t feeling well, Joe made him chicken soup with ginger and green onions. After a half-hour of finishing the soup, Carl felt better and said, “Got any cookies?” Joe whipped up a new recipe for this cookies, which I had the pleasure of nibbling on during our cooking session. If a way to a man’s heart is through his stomach, jot down this recipe and serve it to your guy at dessert. Sprinkle the pecans into a small skillet over medium-high heat. Cook, shaking the pan frequently, until the nuts start to brown and become fragrant, a few minutes. Immediately transfer them to a plate to cool; if you leave them to cool in the pan, they can burn. Once they are cool, chop them. Preheat the oven to 350 degrees Fahrenheit. In a mixing bowl, whisk together the all-purpose and whole wheat flours, oats, coconut, baking soda, and salt. In a separate bowl, using an electric hand mixer on medium-high, beat the butter and sugar until fluffy. Beat in the egg and Fiori di Sicilia. Reduce the mixer speed to low, add the flour mixture, and mix just until incorporated. Stir in the chocolate chunks and pecans. Line two baking sheets with parchment paper. Drop 1/4-cup mounds of dough onto the sheets, 4 inches apart. Bake, rotating the sheets halfway through, until golden brown on the edges, 12-15 minutes. 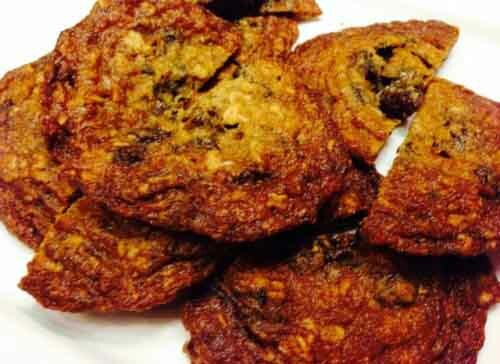 Remove the cookies and let them cool on the baking sheets. The cookies can be stored in an airtight container at room temperature for up to three days. Note: You can freeze these before baking. Just drop the mounds onto just one baking sheet, as close together as you need without touching, and freeze them until firm. Then transfer them to heavy-duty freezer bags and store in the freezer for up to six months. To bake from frozen, increase the time to 25 minutes or longer. Many thanks to Joe Yonan and Ten Speed Press for permitting us to feature this love potion recipe. Click here to purchase your copy of the book. Looking for more Love Potions romantic recipes? We’ve got you (and your date) covered. It’s Thanksgiving week and never to late to add a sweet addition to your holiday menu. Last Thanksgiving we featured Pecan Pumpkin Butter Pie, which is still one of my favorites. 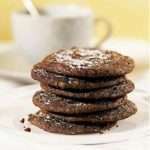 This latest recipe comes from PecanPieRecipe.com and is a wonderful addition to our Love Potions. This two-layer pie has a bottom layer of tender sweet potatoes, combined with cinnamon, ginger, nutmeg, cane syrup and vanilla. The pecan pie filling is spread over the top with a garnish of whipped cream and chocolate curls. 2. Combine sweet potatoes, cane syrup, cinnamon, ginger, nutmeg, 1 egg, and 1/2 teaspoon of the vanilla in a large mixing bowl. 3. Spoon sweet potato mixture into the unbaked pastry shell. Spread smooth. 4. 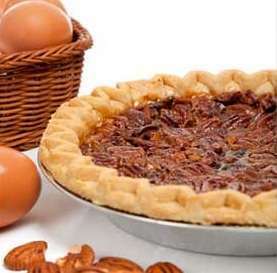 Sprinkle pecan pieces onto the filling. 5. Beat 4 eggs in a large bowl. Add 1-teaspoon vanilla, corn syrup, sugar, brown sugar, and salt. 6. Pour egg mixture over pecans. 7. Bake 1 hour, or until pastry edges are golden brown, and filling is set. 8. Cool on wire rack. Allow 1 hour. 9. Remove from the oven and cool on a wire rack for 1 hour before serving. 10. Garnish with chocolate and sweetened whipped cream. All of us at Cyber-Dating Expert wish you a very Happy Thanksgiving. It’s time to bring this delicious love potion out of the archives to celebrate St. Patrick’s Day. 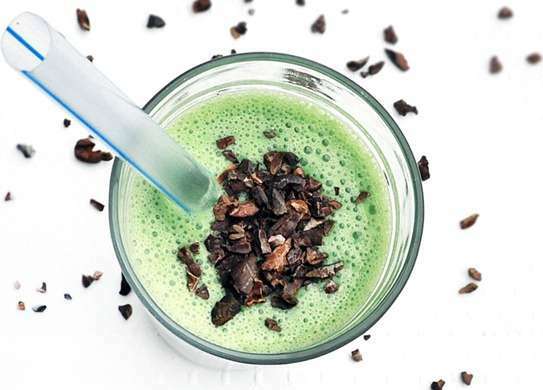 If drinking green beer or nibbling on a mint-chocolate chip ice cream cone aren’t on your menu, we’re thrilled to share Rose Cole’s healthy recipe for her Raw Mint-Chip Shamrock Shake. Blend everything together and enjoy! 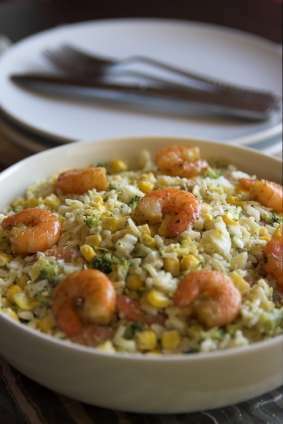 For more healthy recipes, visit RoseCole.com. Looking for a delicious desert to make for your Valentine? 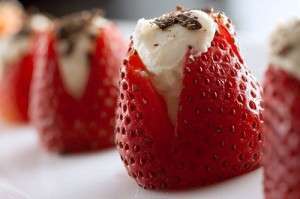 This sumptuous Stuffed Strawberries With Mascarpone Cheese and Dark Chocolate recipe is a perfect for couples who prefer dining out but like their “dessert” at home. The strawberries are fantasy food for lovers: finger-amiable, juicy and sweet. Combined with the mascarpone cheese and the the dark chocolate, it’s a delicious treat to share with your sweetheart, both decadent and healthy. 1. Rinse and dry strawberries. With a paring knife, remove the hull and inner meat of the berry, forming a cavity in the berry. Also slit the sides of the strawberry in quarters just a little to allow for stuffing. 2. Mix stuffing ingredients until incorporated. With a small teaspoon, stuff the cheese filling into the cavity of the berry. Sprinkle additional grated chocolate on top. Serve cold. Love Potions was contributed by The Seduction Cookbook: Culinary Creations For Lovers and can be found on page 66 of the book. This Thanksgiving season, we searched near-and-far to find the perfect Love Potion romantic recipe to bake for your sweetheart, while showing gratitude for your relationship. 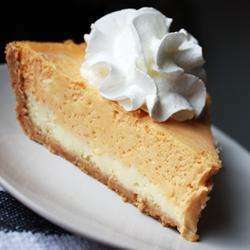 With over 1500 rave reviews on AllRecipes.com, this double layer pumpkin cheesecake recipe tops our list for Thanksgiving. If you have four hours of time on your hands, along with a spare 425 calories, this recipe must be on your list this year. Not spending Thanksgiving with your sweetheart? Don’t fret. This yummy recipe can be shared throughout the holidays. Let your cyber-date know what’s on the menu and he’ll happily schedule you in his calendar. 1. Preheat oven to 325 degrees F (165 degrees C). 3. Add pumpkin, cinnamon, cloves and nutmeg to the remaining batter and stir gently until well blended. Carefully spread over the batter in the crust. October is National Seafood Month, so we thought we’d bring back one of our favorite Love Potions dishes for your dining pleasure. You can steam some fresh asparagus and serve the rice over the aspargus with the tips pointing out. The Love Potion recipe was contributed by Heatherr Jumah. Click here for more Love Potions Recipes. Just in time for summer, Match.com’s Stir Events held a cooking class attended by 16 singles in Los Angeles. Knowing I could improve on my culinary skills, I was one of the first to sign up. The event was held at Sur la Table at the trendy Farmers Market at The Grove with an even mix of men and women. Sure there was a lot of comparing dating disasters and bad dates, but everyone had a wonderful time. We prepared three dishes, led by Chef Alexx Guevara including Perfect Risotto, Grilled Chicken and Vegetable Kabobs, and a light summer desert of Mixed Summer Berries with Zabaglione. My favorite dish was the Perfect Risotto, worthy of being featured in our Love Potions and being served to impress your next Internet date. Pour the chicken stock into a large saucepan and bring to a boil over high heat. Decrease the heat to the lowest setting, cover, and keep hot. Fill a small saucepan with water and heat over high heat until boiling. Lower heat, cover and keep hot. In another large saucepan, heat 2 tablespoons butter over medium heat until butter foams. When foaming subsides, cook shallots until softened, stirring frequently with a wooden spoon, about 3-4 minutes. Add rice and cook, stirring constantly until evenly coated with butter and heated through, about 3 minutes. Increase heat to medium and, using a ladle, add about 1 cup of hot stock to the rice. Cook, stirring constantly with a wooden spoon, over medium heat until stock is almost fully absorbed. Add the remaining stock 1/2 cup at a time, stirring constantly and adding more broth after the previous addition has been absorbed, until the rice begins to pull away from the sides of the pan, about 16-2o minutes. Adjust the heat so the rice simmers rapidly throughout the cooking. Use boiling water if stock has been used and rice requires more cooking time. 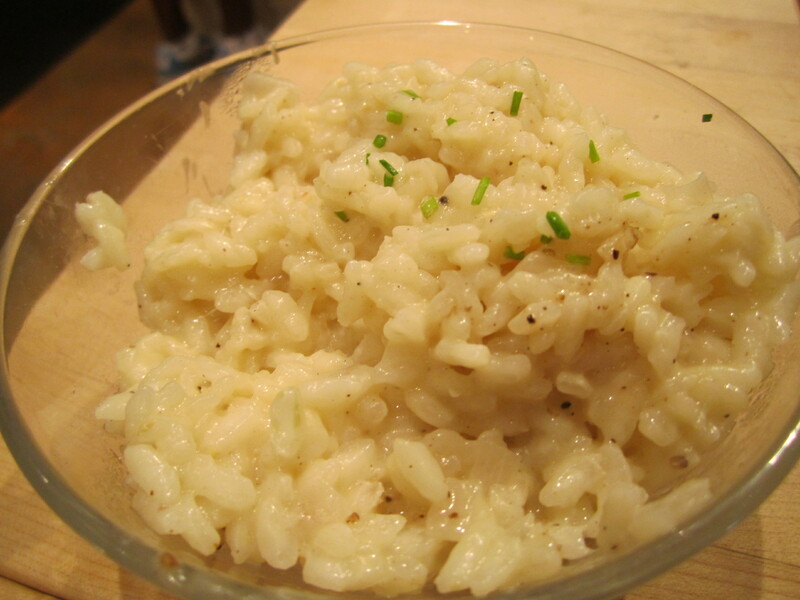 The risotto is done when it is creamy and the grains are plump and tender with a slight resistance to the bite.? Season to taste with salt and white pepper. Remove from heat and stir in the remaining 1 tablespoon butter and Parmesan. If risotto is thick, use any leftover stock to thin as needed. To serve, ladle risotto into 4 warmed shallow serving bowls. Sprinkle with chives and serve immediately. For more romantic recipes worth serving on a date, Visit Love Potions. Julie Spira is an online dating expert, bestselling author, and founder of Cyber-Dating Expert. She creates irresistible profiles for singles on the dating scene. For dating advice, sign up for our Weekly Flirt and like us at Facebook.com/CyberDatingExpert. There are many recipes on the Internet for the holiday season, but some of my favorites can be found on the Williams-Sonoma website. This year, they’ve curated a list of recipes guaranteed to spice up your love life. The recipe that made it to the holiday edition of Love Potions is the simple ginger cookies. They say these ginger cookies are irresistible. Ginger is also high in potassium and is known to improve your immune system. Preheat an oven to 350?F. Spread the nuts on a baking sheet and toast until lightly browned and fragrant, 8 to 10 minutes. 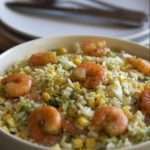 Remove from the oven, let cool and chop coarsely; set aside.In a bowl, using an electric mixer preferably fitted with a paddle attachment, beat together the butter and the 1 1/4 cups sugar until creamy, about 5 minutes. Add the egg and beat until fluffy, about 5 minutes. Then add the molasses and beat to combine.In another bowl, sift together the flour, baking soda, ground ginger, cinnamon, salt and white pepper. Add the flour mixture to the butter mixture and beat until well mixed, 2 to 3 minutes. Stir in the crystallized ginger and nuts until evenly distributed.Lightly flour a work surface. Divide the dough into 2 equal portions. Form each portion into a log about 1 1/2 inches in diameter. Wrap tightly in plastic wrap and refrigerate until well chilled, at least 4 hours or for up to 2 days. Preheat an oven to 325?F. Line 2 baking sheets with parchment paper. Using a sharp knife, cut each log into slices 1/8 inch thick. Arrange the slices on the prepared baking sheets, spacing them about 1 inch apart. Adapted from Williams-Sonoma Lifestyles Series,?Soup for Supper, by Joyce Goldstein (Time-Life Books, 1998). Did you know that this week, October 10-15 is Chocolate Week in the U.K.? Throughout the country, chocolate lovers are attending tasting events?and celebrating the holiday. Here in the U.S., we celebrate National chocolate day in March, perhaps to keep the sweetness of Valentine’s Day alive. Since we live in a global society, I’ve decided we should celebrate from afar. Chocolate, as you may know, has many benefits. It’s an antioxidant and consumed in moderation, can be good for your health. Chocolate makes an excellent gift for someone you may have a crush on and to bring on a date. Sharing chocolate can be romantic as you spoon-feed each other some delicious chocolate mouse. 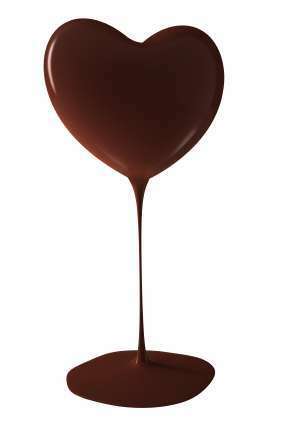 Check out some of our chocolate recipes in our Love Potions for some suggestions for the holiday. Chocolate is passionate. Heart shaped chocolate can be an aphrodisiac, so I suggest you stop by your local chocolatier, guilt-free, and celebrate the holiday.